I like you, Sully. That's why I'm going to kill you last. Is it possible for one man to take on a whole army or two single-handedly? Well, Commando wants you to find out. An endless supply of bullets are handed to you to help take out what seems to be an endless army of well... armies, that you need to take out and rescue your daughter who has been kidnapped...sorry, that's the film again, isn't it? I promise I'll stop with the Commando references now. Open your mouth again, and I'll nail it shut. Of course, infinite bullets are a great way to get people out of your way but surely you need that little something extra to give things that little bit of oomph? Why yes! Hand grenades of course! You are given a handful to start off with but you will also be able to collect more as you go along, where you find boxes full of them scattered around the place. Leaving boxes of hand grenades unattended and uncovered doesn't seem like the most safe of options when it comes to storage of explosives, though as you play through the game, you come to realise that safety isn't top of this army's list of priorities. No, health and safety goes out of the window here and everyone is just hell bent on sealing your demise. Nice. Let off some steam, Bennett. That said, some of the enemies you come across are not exactly the best shot. Whereas they have the right attitude in wanting to kill you, some lack the skill to actually carry out what could be this simple task; given the amount of them, it really shouldn't be that difficult. Though it's not all down to their accuracy of course, your character is really quite nimble moving pretty quickly and more importantly, turning quite quickly too make dodging bullets easy if you know what you're doing. Bear in mind though that it's a 'one bullet kills' situation here so if they do get lucky, you're going down - literally too as should you come a cropper to a bullet or grenade, you subsequently sink into the ground. Cool, eh? Well, kind of. As you make your way through each level, you will also come across some vehicles that need taking out too. Jeeps and tanks are just waiting for you to lob a hand grenade at them (they love it) which disappear in a puff of smoke if you manage to catch them. Awesome! Is there anything that isn't improved by having them blown up by a grenade? If not, I've yet to see it. John! I'll be ready, John! Aside from being an awesome game where you get to shoot people, an added bonus is that when the game is over, you get to carry on shooting things! Hurrah! If you're good enough to get onto the high score chart, your input method is having your character walking back and forth shooting the letters you select. Awesome. When the selected letter is shot it proceeds to spin around for a while whilst you head for another letter. Nice. My trick was to see how many letters I could get spinning at one time before one of them stopped. Think I got to four - see how many you can do and let me know! If you want to, obviously. 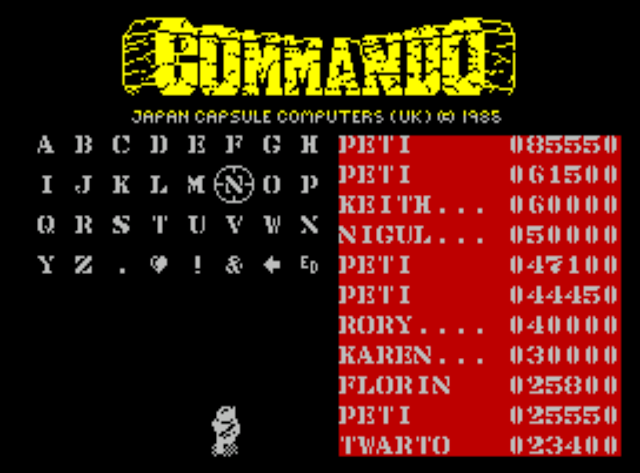 How good a game is Commando? Well, I'd say it is one of the Speccy greats. As far as arcade conversions go, it's pretty much spot on. As we've seen before with software house Elite, they really do know their way around a conversion. Bomb Jack, Paperboy and many others were up there with the cream of the crop of Spectrum games and Commando totally deserves the accolades and respect attributed to it. On top of this, it has those funky multi-coloured loading bars whilst loading which always adds a bit of quality to any game in my book. 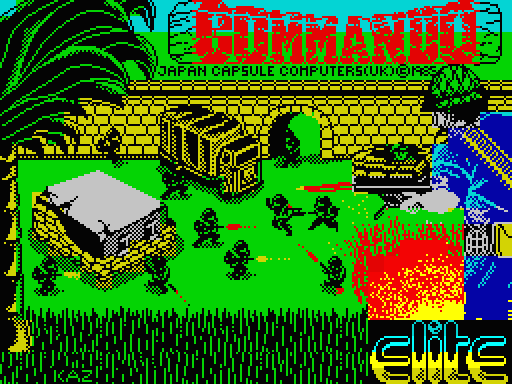 Commando was one of the few games that used to keep me up all night when I had school the next day. Being tired in school didn't go unnoticed and when I told the teachers that it was I was up all night shooting people, it didn't go down well. That was an uncomfortable conversation with the school councilor and then subsequently the police, I tell you. 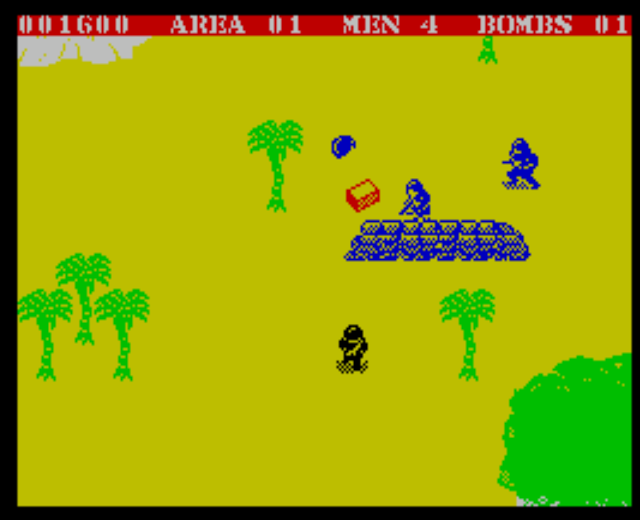 Commando is one of those games you pick up quite easily but then get gripped for hours (see above) as you try to get further and further each time, and it's very satisfying when become a dab hand at dodging bullets, especially when you're that close to getting hit by one and then a quick spin and it subsequently flies just past your head. Phew! 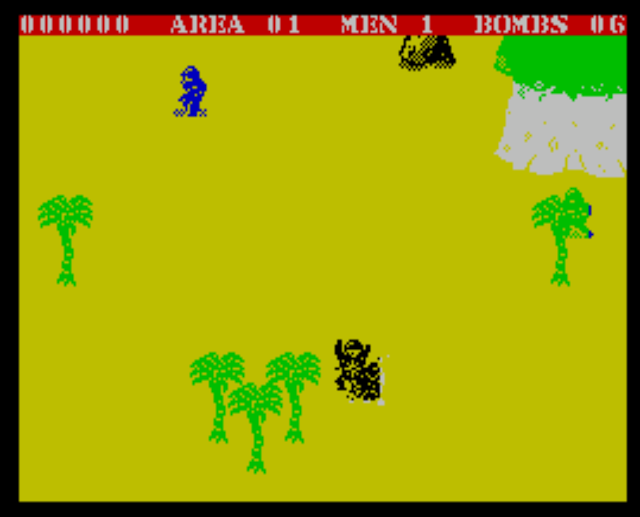 Also, just going on the rampage and hitting 'fire' repeatedly gives you an amazing feeling as you mow down anyone who gets in your way with your machine gun. Very Commando(film)-esque though sadly, no circular saw blades are at your disposal. I eat Green Berets for breakfast, and right now - I'm really hungry! At times it can get very hectic and it seems you are overrun with soldiers all trying to kill you. Honestly, there are moments in some levels where the bad guys literally fill the screen and it'll have you gritting your teeth as you try to twist and turn, avoiding bullets and grenades, and at the same time trying to avoid soldiers from touching you. 'How am I ever going to survive this?' you may say to yourself at this point. Most of the time you won't, in all honesty, but when you do manage to wrangle your way out of it, it will give you a great feeling of satisfaction. Remember when I promised I was going to stop with the Commando references?